DLM Enterprises also works with restaurants, grocery stores, and other businesses to provide cost effective commercial heating, air conditioning, and refrigerator services. Regular maintenance of commercial heating and cooling systems, along with refrigeration, is essential to creating a comfortable, efficient environment for employees and customers. DLM Enterprises in Florence offer seasonal maintenance, such as cleaning the unit and replacing the filter, along with major and minor repairs. If you or your food is too warm or too cold, our technicians will come out to your location as soon as possible to get your system running smoothly again. We provide accurate estimates and quick turnaround times. We also install new or replacement heating systems for every commercial environment. This includes gas or electric furnaces, ventilation systems, auxiliary fans, fireplaces, and thermostats. Whether you’re building a new location, remodeling, or replacing outdated heating systems, our HVAC company has the equipment to fit your building’s size and layout as well as your budget. Don’t sweat through another Florence summer—our technicians install air conditioning systems for commercial customers to keep you cool and comfortable in the warmest weather. We have central and window air conditioning units and can install them with new or modified ventilation systems, industrial fans, dehumidifiers, and thermostats. 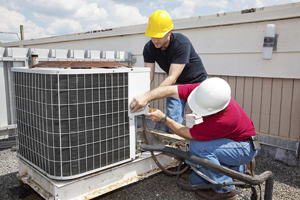 DLM Enterprises can customize your cooling system to meet your location’s needs. We also offer commercial refrigeration products for restaurants, hotels, hospitals, grocery stores, food service companies, and any other location that requires food storage. This includes large refrigerators, walk-in refrigerators and freezers, deep freezers, coolers with glass doors, and other specialty refrigeration units. If you need a replacement unit immediately to avoid food spoilage, we can accommodate emergencies as soon as possible. DLM Enterprises in Florence specializes in offering commercial restaurant equipment, including walk-in freezers, walk-in coolers, and cooking equipment such as exhaust fans, ranges, ovens, and grills. Floor and counter top fryers, conveyor ovens, heated cabinets, steam tables, and other items are also available. From a small suite to a large, stand alone banquet hall, we have products to store and cook food in any environment.